Staying active amidst a busy work schedule can be difficult, especially for those who don’t like gyms. Whilst there are many parks in Nanjing, it can be hard to navigate runaway toddlers, elderly tai chi enthusiasts and guards intent on enforcing no fun policies. Add to that the summer heat and your game of ultimate Frisbee won’t last long. Here are some fun suggestions for keeping fit and active in Nanjing. Archery has been popular for a while with Nanjing locals, and another new centre has just opened next door to the shooting club. If you’re interested in developing some decent arm muscles, and don’t mind extensive bruising to your left forearm, this could be the sport for you. The centre features two ranges: ten meters for beginners and twenty meters for the more adept. Instructors will fit you out with safety gear and explain the technique to you, before letting you loose on the foam backed targets. There is a seating area with foreign television and drinks to rest between rounds. The instructors speak some English. Ice skating, as we’ve seen from the Sochi Winter Olympics, is big in China. There is a popular ice rink in Deji Plaza, where you will be faced with the slightly frightening sight of hordes of small children hurtling towards you at great speed – many of whom have not mastered the art of stopping. VIP cards offering packages are also available. Rock climbing could be a fun afternoon out if you have a head for heights. Nanjing Normal University houses the city’s only climbing gym. Prices are 160 RMB per person, but you can purchase advance tickets on Taobao for about 50 RMB. You will also need to rent shoes and a harness. Horse riding stables where you can arrange lessons can be found on the outskirts of Nanjing. These are going to take a bit of work to reach as most clients have their own transport and I’m told they are not easy to find by yourself. The centre is open 09:00-17:00 except in bad weather; you can call ahead to arrange a lesson. Riding is 260 RMB per hour or 2000 RMB for a membership card. If you search for fencing in Nanjing you will find a plethora of options, unfortunately most of them seem to be closed. Those still featuring active websites list out of date telephone numbers, and the locations themselves are very much locked up. It is possible to arrange lessons with a private fencing tutor (see contact details below) for 7880 RMB a year (which sounds expensive but works out at 40 RMB an hour) or you can also pay in blocks of three months for 2880 RMB. Their training centre is located at the Olympic Stadium and the instructors have experience teaching groups of children. However, they only speak a little English. Golf might be a relaxing way to spend your free time, although the prices may raise your blood pressure. There is a full sized golf course near Zhongshanling set in the beautiful scenery of Purple Mountain. A full price list is outlined on their website in English. The golf course is open in the summer only. Rollerblading seems to be the activity of choice for children in my area, and most of them just zip along the cycle paths with breathless parents in tow. If you’re not up to skating on the streets, rollerblading is also on offer at the Olympic stadium. There is a basketball gymnasium is open from 9:00 am- 21: 00. Tennis courts at the Olympic stadium are already open to the public and there are eleven badminton courts available at the Olympic Sports Center Stadium (Hours 9:00 am-21: 00 Tel: 86690456). There will also be Taekwondo and a dedicated yoga gym, although no information was available on these activities at the time of going to press. The ice skating rink also no longer exists. I went to the archery place apparently its been shut down for years. Somebody needs to update the article. waste of 2 hours. Great article! 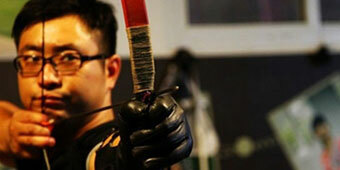 Really interested in archery, so an article like this for Shenzhen would be awesome.